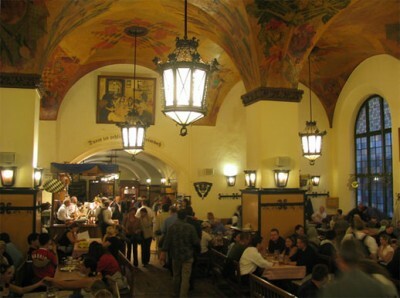 If you’re visiting Munich and drink beer, you probably already know about the Hofbrauhaus (brew court house) downtown. Wilhelm V., Duke of Bavaria, was dissatisfied with the beer brewed in Munich, so in 1589 he established his own brewery, the Hofbrauhaus (brew court house) to serve only his royal court (talk about an elitist brewery). It wasn’t until 1828 that it became open to the public. – Ongoing events every night, often involving both live music and dancing. In other words, it’s a party atmosphere. – A restaurant that serves signature Bavarian dishes. – An inn for people who don’t want to stumble home too far. – A ballroom for formal events. – A beer garden for informal drinking (something the locals in Queens, NYC appreciate). Today, the brewery is not only a model venue for a festive good time, it’s perhaps become too popular, commercialized with tourism and franchised in other locations around the world. It also happens to host the second largest beer garden tent at Germany’s Oktoberfest which attracts 6 million people annually. Image source: “http://www.flickr.com/photos/roonie/51833046/”>Rich & Angie. Neil, the words in the first part of your paragraph are not visible, you might want to fix the html tags so that the entire paragraph can be seen. Thanks Tammy – how’s it look now? I still can’t read the first sentence in the first paragraph.Maybe, I’m not a computer expert, but maybe your settings are causing this, I don’t know, but I can’t read or even SEE the first words in the beginning sentence..I appreciate your efforts to fix it! Can you email me the specifics using the email link to the right? I can’t seem to recreate what you’re experiencing. I may be difficult to reach in the next few days however. I just noticed this only on Windows Explorer, and it seems to be affected on entries since August! Can you read the entry now? Yes, it’s perfect now! I can see it! Yeah, I have Windows Explorer so maybe that’s why I can see it and you couldn’t at first..yes previous entries were affected.